The following inscription is found near the Gopālakṛṣṇa temple at Bairākūr, Mulbagal taluq, Karṇāṭaka. The inscription is in Tamil and inscribed in Vaṭṭeḹuttu characters. The inscription is fragmentary and denotes the 12th regnal year of Vijaya Īśvara varmā who can be identified as Parameśvara varmā I of Pallava dynasty. The inscription refers to the hostage of some kārōniri Vāṇarasar whose identity is not known. Then it refers to the death of some person. Since the inscription is damaged almost the details are not known. The date of the inscription is 682 CE. 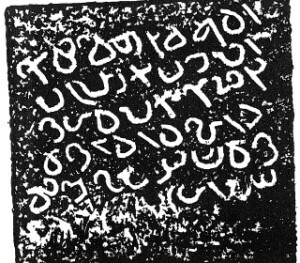 Though the inscription is fragmentary, I think this can be taken as an evidence for the expedition of Parameśvara varmā I towards the Cālukya capital Raṇarasikapura which is mentioned in the Kailāsanātha temple of Kāñcīpuram. Though there is no tangible evidence to prove this claim, this single inscription can be mentioned here to have the idea that the rule of pallava extended upto this region. The inscription is published in the Epigraphia Carnatika Volume X.
Epigraphy inscription, Karnataka, Pallava, Paramesvara varman, Vanarasa. permalink.